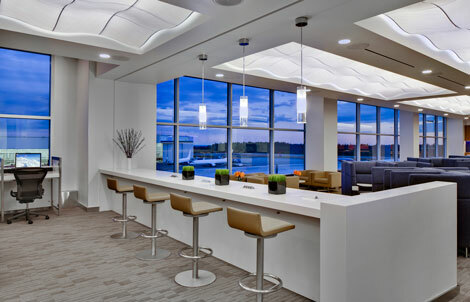 This is one of Delta’s new SkyClub lounges and looks similar to the one in New York, reviewed here. When you take the lift (or the stairs) up one level you have a choice of turning right for the Delta Sky Club and right again for the British Airways lounge. 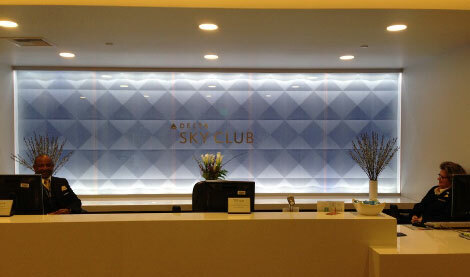 The entrance is attractive, with the Sky Blue colour reflecting the name of the lounge. 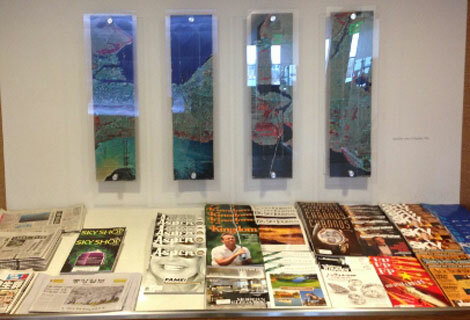 If you look behind you as you approach the counter there is a fairly good selection of magazines, including the US edition of Business Traveller. 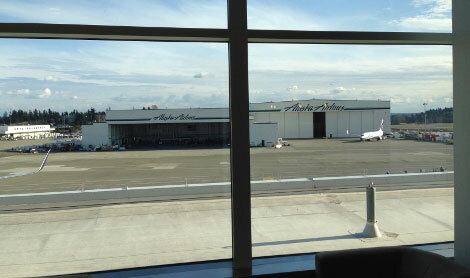 Once inside the lounge, large windows look out onto the apron, although the major bit of branding you see through those windows is actually for Alaska Airlines. The lounge has a relaxing design, with a wavy pattern on the ceiling and different styles of chairs breaking up the area so it doesn’t seem like one big room. High-backed chairs at one spot also provide privacy, especially if you want to have a doze. The photography on the walls, like that in New York, is of colourful aerial views of different part of the world, although from a distance they almost look abstract. 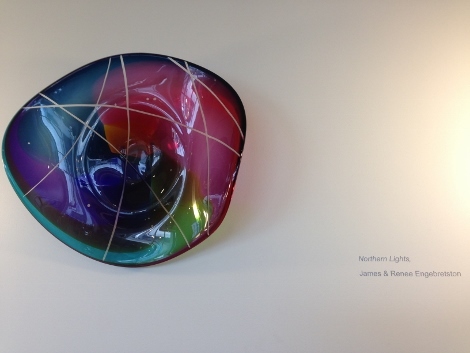 There are also blown glass artworks on the wall by James and Renee Engebretson. There are several areas to the lounge, including a quiet meditation area (I didn’t take a picture of that to avoid disturbing anyone), but most importantly there are lots of powerpoints for charging devices and working at, including high tables which are an efficient way of fitting more people into the lounge. The bar has a range of complimentary (house) drinks, and then for premium beers sand spirits, you pay. The food offering at this time in the afternoon includes lots of nibbles such as crudities (carrots, celery) with dips, two types of Garrett’s popcorn, which proved very popular with my travelling companions, and the usual coffee machines and selection of biscuits. The lounge also had free wifi, which was very fast for an airport facility, although of course that might be because the lounge was not very busy at this time of the afternoon. In fact, these photos show how quiet it was, although this flight was only one third full being at the start of Delta’s London Heathrow service. 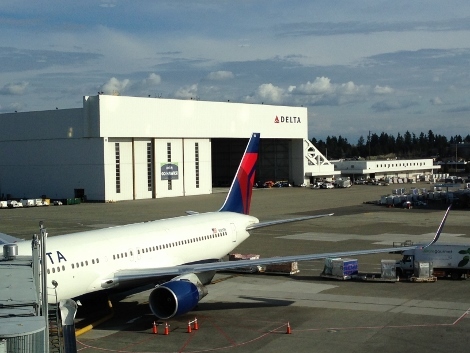 I was told that about one third of the flight’s passengers are expected to be originating from the Seattle area, one third from Delta’s feed into the airport (regional and national flights mainly) and one third from the relationship with Alaska Airlines. 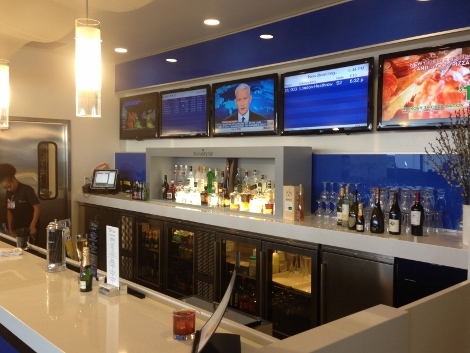 The flight to London was called so we went down to Gate S2 – for a review of the flight, click here. 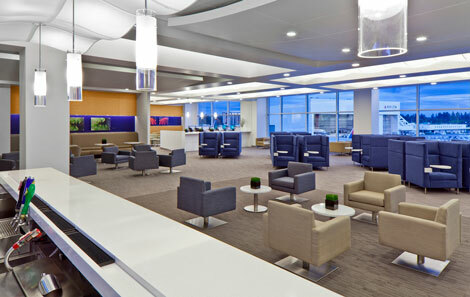 A lovely lounge, a sort of baby brother to the SkyClub at New York JFK, but no worse for that. Good to see that art plays a part, but also practical considerations such as plenty of power points (plugs) and good wifi provision.